In a word, this recipe is golden. You absolutely won’t believe how easy it is to create something so dainty and delicious. 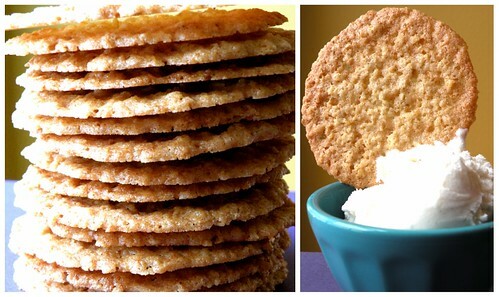 These wafer-thin Lacy Oatmeal Cookies are the perfect accessory for a simple dish of ice cream, a tall milkshake, or a smooth sorbet. And if you hold them up to the light? They look like a stained-glass window. Welcome to the Church of Cookies. (Do you hear angels singing, or is that just me?) 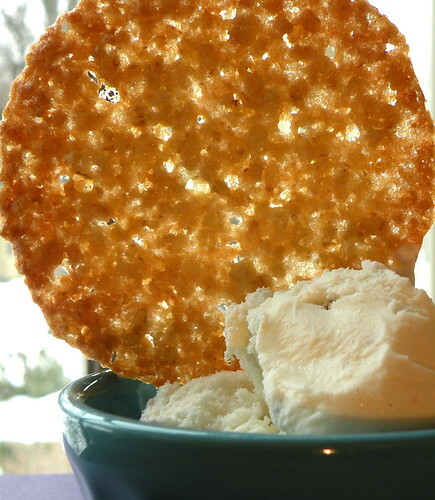 Try these cookies today and add a sweet, delicate crunch to your favorite dish of ice cream. Preheat oven to 325 degrees. Line baking sheets with parchment paper or a silicone baking mat. (If you don’t have either of those, cover your baking sheet with foil and a coat of nonstick cooking spray.) In a medium bowl, combine oats, flour, salt, and baking powder. Mix well with a wire whisk and set aside. In a large bowl, combine sugar and butter with an electric mixer at medium speed to form a grainy paste. Add egg and vanilla, and beat until smooth. Add flour mixture and blend just until combined. Drop dough by teaspoons onto your prepared baking sheets, with at least two inches between. Bake for 9-12 minutes or until edges begin to turn golden brown. Let cool, then peel off cookies carefully with your fingers. Looking for the perfect gift for all occasion? Shop our collection of cookie gift baskets and cookie bouquets! These sound so delicious and are the perfect recipe for spring! I made these today with a few substitutions…..they’re all gone! I used whole wheat flour, coconut oil instead of butter, and pinch of cinnamon. If you want this to be extra delicious brown the butter first! Just made these… you have to place them much further apart than two inches… just so those who have never made them know. But they taste great! And the ones I put further apart are beautiful. There’s evidently a bundle so that you can identify concerning this. We consider you’ve made various fine tips during capabilities additionally.